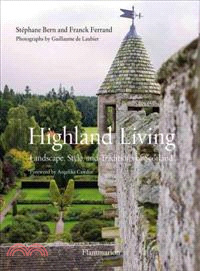 An illustrated volume that pays tribute to Scotland’s multifaceted allure, from striking natural landscapes to elegant castle living. The craggy peaks and reflective lochs of the rugged Scottish landscape have inspired writers and travelers for centuries. With its rolling hills and quiet hamlets, Scotland is a patchwork of stunning green valleys and windswept moors, scattered with the stony ruins of ancient abbeys and castle strongholds. From the peat bogs of the Highlands to the ordered elegance of Lady Cawdor’s Castle, stunning photographs capture Scotland’s national treasures. Draw inspiration from cozy interiors that feature handcrafted furniture, tartan accessories, and outdoorsy details such as hunting trophies and painted landscapes. Discover Scotland’s colorful traditions from kilts and bagpipes to whisky and haggis. Follow hunters and their dogs on the lookout for fowl and wade into clear running streams where fly fishers catch the bounty of Scotland’s waterways. Includes an address book for travelers and traditional recipes for those seeking a taste of the Scottish lifestyle at home. Lady Cawdor, an interior decorator, is a former Vogue fashion editor and stylist. Stephane Bern is known for his portraits of royal families and figures. He is a popular French radio personality. Franck Ferrand has published Bordeaux Chateaux, Jacques Garcia, and a number of historical biographies. Guillaume de Laubier is a lifestyle photographer. His work has been featured in Elle Decoration, Vogue, and A French Country Home.